New Library Store obsession— canning! Although we’re a bunch of pretty busy ladies with too many crafty hobbies to count, we’ve all been making time to dive into this new (and tasty!) endeavor. The best part is trading our jars of homemade yummyness! Who would refuse a jar of freshly made Strawberry Lavender jam, really? So this week we’re going to be sharing a couple recipes we’ve tried out from Canning for a New Generation by Liana Krissoff. We carry this book in the store, as well as quite a few other books on canning. 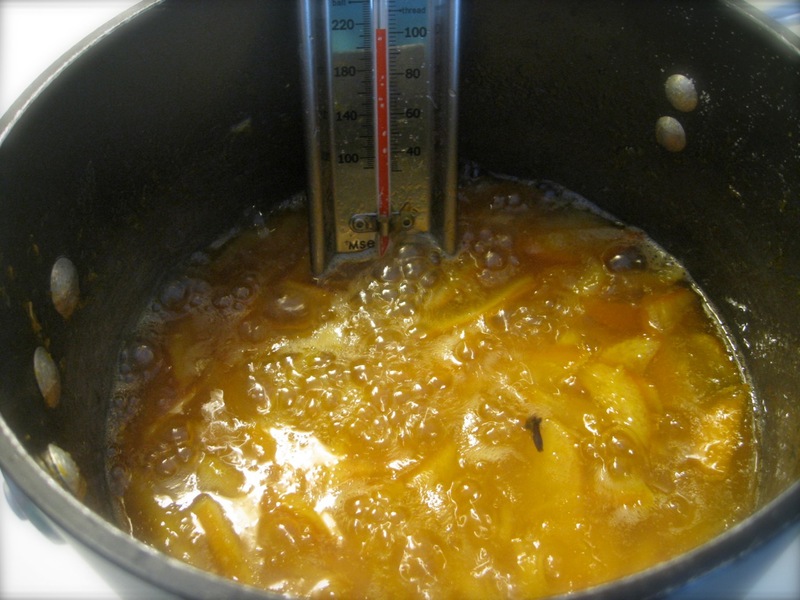 First up is…..
Navel Orange and Lemon Marmalade! For this recipe you’ll need the following: 4 to 4 1/2 lb of navel oranges (well scrubbed), 2 lemons (scrub ’em too), 1/3 cup freshly squeezed lemon juice, and 3 cups sugar. This will make 6 half-pint jars of marmalade. The first step is to sterilize your jars and prepare them for water-bath canning. This involves submerging your jars in a canning pot full of water, and bringing it to a full boil for approximately 10 minutes. 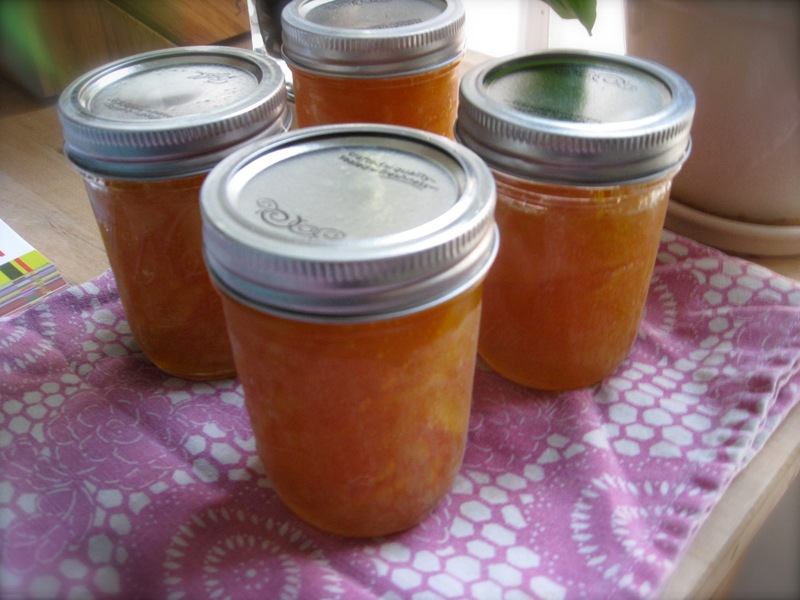 You’ll want to leave the jars in the hot water while you prepare the marmalade, and place the jar lids in a heat proof bowl. Also, place a small plate in the freezer (this will be explained later, I promise). First, use a vegetable peeler to cut the zest from 5 of your oranges. Then stack these strips of zest on a cutting board, and cut them crosswise into thin julienne strips. You should be left with about 1 1/2 cups of zest. Then use a sharp knife to segment all the oranges, working over a bowl to catch the juice and reserve the membranes. Put the julienned zest and the orange segments in a 6 to 8 quart large pot. Strain the reserved juice into a measuring cup, and add enough water to make 3 cups. Pour this into the pot. Cut the bottom and top off of each lemon and cut it into segments, leaving the peel on and reserving the membranes and seeds. Cut the lemon segments into 1/2″ chunks and add to the pan, along with the lemon juice. Bring the pot to a boil over high heat, then reduce the heat to simmer until the zests are tender, approximately 30 minutes. Then add the sugar, and bring the pot to a boil again. Boil, stirring occasionally, until the mixture registers about 220 degrees F on a candy thermometer. Alternatively, if you don’t have a candy thermometer, after boiling for 30 to 40 minutes, you can place a dab of the mixture on your chilled plate and return it to the freezer for a minute. Then take it out, and give it a nudge. If it wrinkles when you do this, it’s ready! If not, keep boiling it and try it again in a few minutes. Ladle boiling water from the pot onto the lids in the heat proof bowl. Using a jar lifter, remove the jars from the canning pot, carefully pouring the water from each one back into the pot, and place them upright on a folded towel. Drain the water off the jar lids. 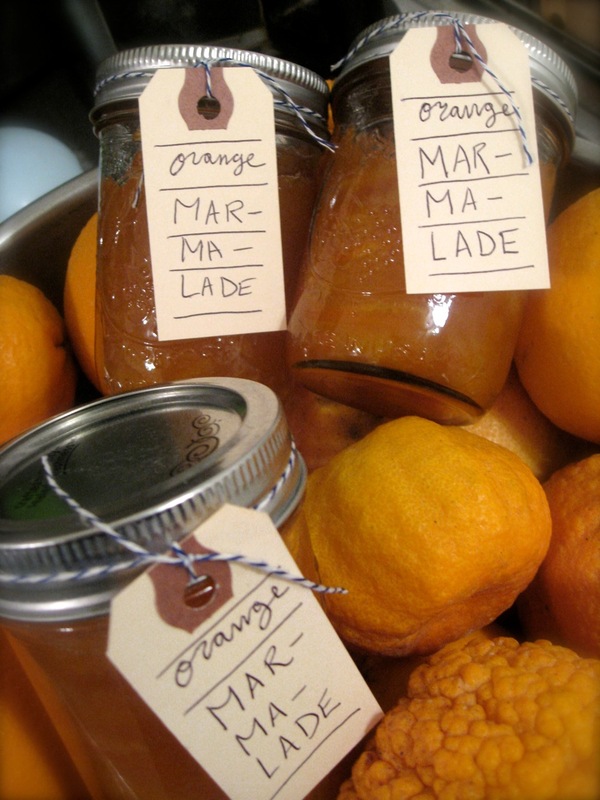 Ladle the marmalade into the jars, leaving 1/4″ headspace at the top. Use a damp paper towel to wipe off the rims of the jars, then put a flat lid and ring on each jar, adjusting the ring so that it’s just finger-tight. Return the filled jars to the canning pot, making sure the water covers the jars by at least one inch. Bring to a boil, and boil for 5 minutes to process. Remove the jars to a folded towel and do not disturb them for 12 hours. Check after an hour that all the lids have been sealed– press down the center of each lid. If it can be pressed down, it hasn’t sealed. The unsealed ones will need to be eaten right away, what a bummer…! Good luck, and bon appetit! Later this week we’ll be sharing a recipe for Strawberry Lavender jam, also from Canning for a New Generation. So check back!